The Obama administration will not commit to halting its effort to help Iran access the U.S. dollar, despite past commitments to do so, according to a new congressional inquiry obtained by the Washington Free Beacon into the Treasury Department’s refusal to uphold its promises. Leading senators are threatening to block all consideration of Treasury Department nominees until the administration ends its bid "to enable Iranian access to U.S. dollars" throughout the international financial system, according to a letter sent Thursday to the Treasury Department by Sens. Marco Rubio (R., Fla.) and Mark Kirk (R., Ill.). Potential Iranian access to the U.S. dollar has caused friction between Congress and the Obama administration, which initially vowed during negotiations with Iran that such a move was out of the question. 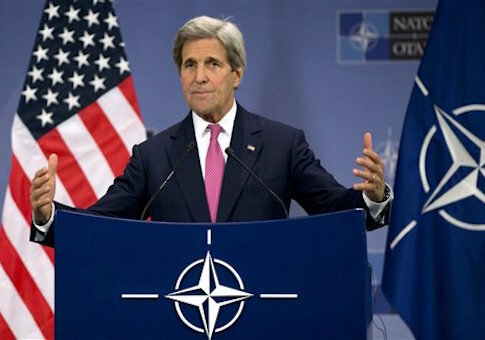 However, senior administration officials, including Secretary of State John Kerry, have publicly sought to encourage Europeans to reengage in business with the Islamic Republic following last summer’s comprehensive nuclear agreement. "We want to make it clear that legitimate business, which is clear under the definition of the agreement, is available to banks," Kerry said in London last week. The administration has been intentionally side-stepping questions about methods to give Iran backdoor access to the U.S. dollar, according to senior congressional sources informed of the matter. The administration has assured lawmakers it will not grant Iran direct access to the U.S. financial system. However, it will not discuss backdoor methods in which U.S. dollars are given to Iran via international banks, source said. "Whenever the administration gets asked whether it'll allow Iran's terror-sponsoring regime access to dollarized transactions outside of the U.S. financial system, a transaction that some people are starting to refer to as ‘Z-turn' transactions, it flat-out avoids the question and instead says it doesn't plan to allow Iran to engage in so-called ‘U-turn' transactions or direct access to the U.S. financial system, something which lawmakers already know," the source explained. "This is the equivalent of giving an answer about oranges when you've been repeatedly asked about apples, and doesn't change the fact that the critical questions about ‘Z-turn' transactions for Iran really need to be clearly answered by the Treasury Department, once and for all," the source said. The apparent shift in the administration’s rhetoric on the issue has deepened concerns on Capitol Hill about alleged White House efforts to mislead Congress and the American people about the contents of the nuclear deal. Rubio and Kirk are threatening to block all Treasury Department nominees from Senate consideration until the Obama administration answers questions about efforts to help Iran get access to U.S. dollars in the international marketplace, according to the letter obtained by the Free Beacon. "We are disappointed that you ignored the request in the March 30th letter from Senators Rubio and Kirk to provide ‘assurances that the United States will not work on behalf of Iran to enable Iranian access to U.S. dollars elsewhere in the international financial system, including assisting Iran in gaining access to dollar payment systems outside the U.S. financial system,’" the senators wrote. "We do not support the consideration of Treasury Department nominees until our request is directly answered." Kirk and Rubio initially petitioned the Treasury Department in March to seek firm assurances that officials would commit to blocking Iranian access to the U.S. dollar. The Treasury Department, in a May 11 response to Kirk and Rubio's initial inquiry, declined to address specific questions regarding efforts to promote Iranian access to the U.S. dollar via foreign transactions outside the American financial system. A month ago, the Obama administration launched a quiet push on Capitol Hill to reassure lawmakers that it would not grant Iran any access to the U.S. dollar or American financial markets, according to a Free Beacon report at the time. That stance appears to have shifted in recent weeks, prompting concern from Iran deal critics such as Rubio and Kirk. The Obama administration is now going above and beyond the purview of the nuclear agreement to help boost Iran’s economy, the senators allege. "In its determined effort to provide Iran’s terror-sponsoring regime with benefits that were not expressly included in the ill-conceived Joint Comprehensive Plan of Action, the Administration is on a path toward undermining the reputation of the United States as a global leader in antimoney laundering and countering terrorism financing," they write. "Access to the U.S. dollar is not an international right. But if Tehran wants access, the onus should be entirely on Iran to clean up its act—including by verifiably ending its sponsorship and financing of terrorism, its ballistic missile program, and its human rights abuses against the peoples of Iran and other nations—and reduce the risks that any financial transaction with Iran poses to the global financial community," the letter states. The outgoing Obama administration is waging a public campaign to encourage businesses to reenter the Iranian market place, which has been known as a key front for money laundering and terrorism funding, despite Iran’s continued pursuit of ballistic missile technology, which could carry a nuclear payload over great distances. "Sadly, the Administration appears to be more focused in capitulating to Tehran than in forcing Iran’s terror regime to fundamentally change its behavior," the lawmakers write. "It’s high time for the U.S. to stop making unreciprocated concessions and to start holding Iran fully accountable for continuing its dangerous and destructive behavior." The Senate Banking Committee is scheduled to hold two hearings on Iran next week and sources disclosed that this issue will be a primary focus for Congress. This entry was posted in National Security and tagged Iran, Iran Nuclear Deal, John Kerry, Marco Rubio, Mark Kirk. Bookmark the permalink.